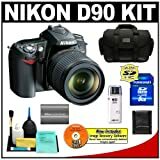 This is a complete kit which contains the body, the lens attachment (18-105mm), SD memory card, a carry case to protect the camera, a USB card reader, and more. Considered a camera for serious photography, but at an affordable price range. 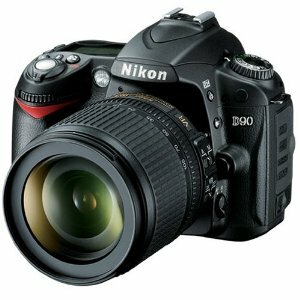 The Nikon D90 SLR Digital Camera, with its 12.3-megapixel DX-format CCD, 3" High resolution LCD display, Scene Recognition System, Picture Control, Active D-Lighting, and one-button Live View, provides photo enthusiasts with the image quality and performance they need to pursue their own vision while still being intuitive enough for use as an everyday camera. The Nikon AF-S 18-105mm VR lens features built-in Vibration Reduction II system providing equivalent shutter speeds 3 steps faster than standard lenses. It also has one ED glass element and one aspherical lens element, optimized for use with DX-format SLRs. The 18-105mm also features ultra-compact Silent Wave Motor allows for blazingly quick, silent autofocus. Take more high-resolution pictures faster with this 8GB High-Capacity SecureDigital (SDHC) memory card. Increase your shooting capacity with this powerful Nikon EN-EL3e Lithium-ion rechargeable battery. This durable carrying case will easily hold your camera with attached zoom lens, plus four lenses, a flash, and accessories. Features a fully padded main compartment with adjustable dividers, and numerous pockets to store smaller items.